I had high hopes for Seeker but I ended up having to DNF the book at 21%. The book was just not for me, I tried to keep reading but it soon became a chore to even pick it up instead of something I looked forward to reading. I had some serious issues with the world building in this case the lack of it. I found myself confused trying to figure out what day and age this book was set in. At first I thought it was in the medieval days but then there is a mention of a gun and then later on one of the characters is watching t.v. I just found it frustrating. 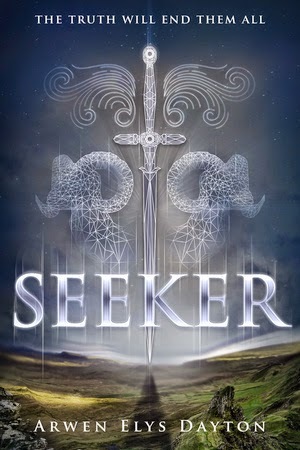 Also what is a seeker? I still don't really know. I figured I would stick with it until Quinn takes her oath, hoping that after that things will make sense and pick up but I felt cheated. During the oath ceremony Quinn goes through a portal where they come across a home and she is pretty scared. Then right after that it jumps to the next chapter with Quinn back from where ever she went covered in blood. We have no idea what happened at that house, to me that is a pretty important scene to leave out and I don't know the characters well enough or their world to be able to figure it out on my own. Also I didn't connect with any of the characters and their dialogue did not feel natural.